THURSDAY, Jan. 22, 2015 (HealthDay News) -- Having knee pain while using the stairs may be an early sign of arthritis, a new study suggests. "At present, we have little concept of 'early' osteoarthritis and often only see people when they have significant, longstanding pain and loss of function," research leader Philip Conaghan, a professor of musculoskeletal medicine at the University of Leeds in England, said in a university news release. "This research is vital to understanding early symptoms of knee osteoarthritis," he said. The study included more than 4,600 people who were at high risk for arthritis. Researchers followed the volunteers for up to seven years. Using stairs was the first weight-bearing activity in which people with early knee arthritis noticed pain. They later developed pain while walking, standing, lying or sitting, and finally, while resting in bed. "Knowing this will help us intervene earlier, perhaps leading to more effective ways of treating this very painful condition," Conaghan explained. 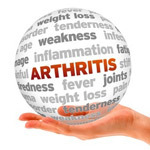 The study was published in the January issue of the journal Arthritis Care & Research.